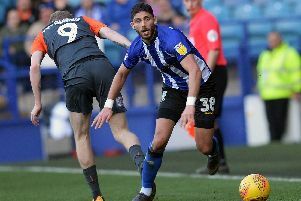 Kieran Lee and Caolan Lavery have given their support to head coach Stuart Gray as the man to lead Sheffield Wednesday’s push for promotion next season. Speculation continues to surround Gray’s position at Hillsborough with owner Dejphon Chansiri yet to emphatically back the 55-year-old since the end of the season. Chansiri gave Gray his ‘full support’ when his takeover was completed in March but has not offered similar assurances despite rumours of the Thai businessman looking for a new man. Those rumours were stirred up once again yesterday with claims in Romania that former Owls defender Dan Petrescu had turned down an offer a role with a Championship club, with Wednesday quickly linked. But Lavery and Lee are unwavering in their support for Gray, particularly the latter who says the Owls boss was a major factor in him signing a new contract last week. “All the lads have a lot of respect for Stuart Gray,” Lee said. “He was a big reason why I wanted to stay here. “I have a good relationship with him and I enjoy playing for him. Lavery is similarly full of praise for Gray. Lavery added: “He knows what he wants from his players and if you’re not delivering, he will make changes. It was a revelation about Petrescu yesterday from the president of a Romanian club that raised further speculation on Gray’s future yesterday. Petrescu – who played for the Owls during the 1994-95 season – joined ASA Targu Mures as manager this week. And ASA president Bogdan Mara claimed the former Romania international was offered a role with an unnamed Championship club. Mara said: “He received an offer from abroad, from a club in the Championship. “It was a concrete offer today to go to England, but he refused. Romanian sport website Digisport claimed the club in question were indeed Wednesday, with Petrescu delaying his decision to sign with ASA to mull over the offer.